The greatest cavalry commander of his day, Anglesey served (as Lord Paget) under the Duke of York in Holland, with Sir John Moore in the Peninsular War, and (as Earl of Uxbridge) as Wellington's second in command at the Battle of Waterloo (1815), where he fought heroically and lost a leg (earning him the nickname 'One-leg'). He was created Marquess of Anglesey on 4 July 1815 in recognition of his services. He later served Wellington in the political sphere as his fair-minded but controversial Lord Lieutenant in Ireland (1828-1829), and he returned to Ireland for a further period under Lord Grey (1830-1833). He was appointed Field Marshal in 1846. Henry Edridge was born in London and trained at the Royal Academy Schools, where he attracted the notice of Reynolds, who allowed him to copy some of his paintings in miniature. Although he produced landscape and topographical work, Edridge is best known for his miniatures and small portraits, elegant and refined, which he exhibited at the Royal Academy from 1786 until his death. Edridge's portrait of Lord Paget was seen at the Royal Academy in 1808. The exhibition opened on 2 May, and his drawing must therefore have been executed before that date, and before Paget's promotion from Major-General to Lieutenant-General on 25 April that year. He is portrayed wearing a general officer's uniform as Colonel of the 7th Light Dragoons (Hussars), and in the background is a generally appropriate scene of cavalry riding down to an estuary. 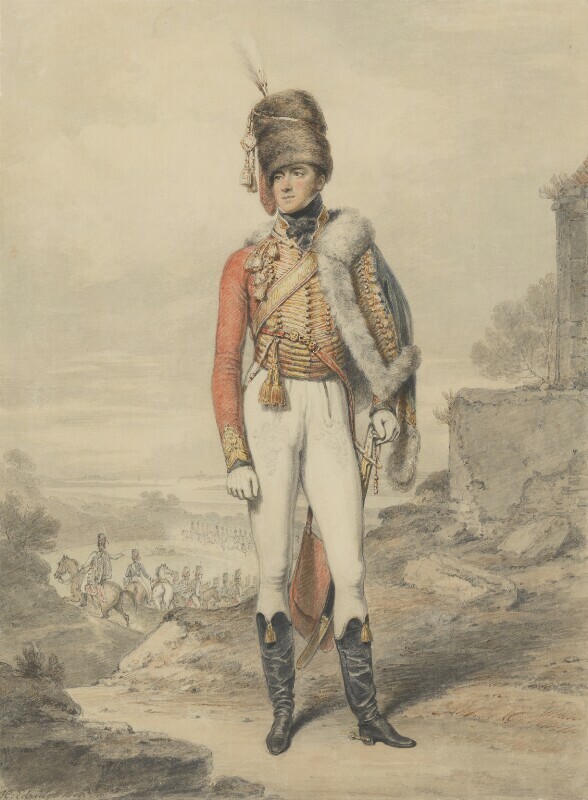 There is no evidence to support the suggestion made by Richard Walker (who was unaware that the portrait was exhibited at the Royal Academy) that the site may be Vigo Bay or Corunna, and that it was added to the drawing after the sitter's return from the Peninsular War early in 1809. This is a glamorous image of the youthful aristocrat, the head touched with carefully controlled sentiment, and it may have influenced Sir Thomas Lawrence when he came to paint his three-quarter-length portrait of Lord Charles Stuart, later 3rd Marquess of Londonderry, in a Hussar's uniform (National Portrait Gallery; exhibited at the Royal Academy in 1812). The French General Andoche Junot remarked of Paget in Lisbon in 1808: 'J'ai toujours suppose que Lord Paget était le plus beau garçon d'Angleterre'. To Baron Stockmar, the Swedish ambassador, he appeared in 1816 to be 'a tall well-made man; wild, martial face, high forehead, with a large hawk's nose which makes a deep angle where it joins the forehead. A great deal of ease in his manner'. In 1808 Edridge exhibited eight works at the Royal Academy and was keen to make a show, for, as an entry in Joseph Farington's Diary (2 May 1808) makes plain, he was anxious 'to become one [a Royal Academician] if the laws of the Academy allowed it'. However, as a draughtsman as opposed to a painter, Edridge was ineligible (Farington, entry for 9 June 1808), and he only succeeded in becoming an Associate of the Royal Academy, and that not until 1820. Royal Academy 1808, no.588, 'Lord Paget'; purchased by the Gallery from P. and D. Colnaghi and Co. Ltd, 1870.